The software’s instructions are step-by-step guides on the package services, especially on how to set them up. If you or your subscribers need more information on that, you can view the instructions online. a) Right-click on the subscriber whose service you would like to know more, go to Subscriber Reports, then click Subscriber Instructions. b) Click on the subscriber on the main table, then go to Subscriber on the menu bar, go to Subscriber Reports, then click Subscriber Instructions. c) Simply click the toolbar shortcut to print instructions. The software will then provide you with a list of usernames for the services availed by the subscriber. Just select the username that matches the service whose instructions you would like to see, and the online instructions will open. For example, you would like to find the instructions regarding the setup of the Email service for your subscriber Jane Doe. Take note of her email username first: on the main table, click on that subscriber, then go to the lower tab on Packages, click on her Email service, and see her username (for our example, her email username is jdoe). Then go back to the main table; right-click on the subscriber and click Subscriber Instructions. 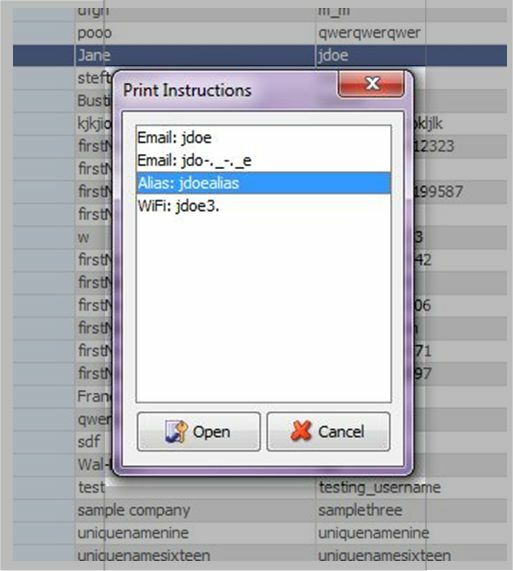 When you see the list of her usernames, select the one for her email – in this case, click jdoe. Click Open, and you will then be directed to the webpage that has instructions for setting up the email service for her.